Fashion For Men, issue n°1, courtesy of Milan Vukmirovic for models.com. With his diverse and fashion forward track record, news of the launch of a new Milan Vukmirovic venture creates instant excitement for a dedicated fashion follower. Tune in as Mr V gives us a quick update on his latest print venture, Fashion For Men. MDC: How would you describe the aesthetic of Fashion For Men? Milan: Very elegant, simple, modern and masculine. MDC: Who are some of the artists and contributors to this first issue? MV: Riccardo Tisci is the guest of honor, Tommy Ton is a major contributor, Anna Dello Russo has a big fashion story inside as a model. She is the only woman in the magazine. The magazine has also 12 fashion stories presenting some of the best new models, like Greg Nawrat, Travis Cannata, Tomas Bukovatz, Ian Mellencamp, Chris Moore, Eric Puzio and more…. MDC: What led to the bold choice of your first cover. What is the message behind this idea? MV: The rottweiler was the theme of Riccardo Tisci’s collection for Givenchy this winter. It’s strong and aggressive. I wanted the cover to be strong too. 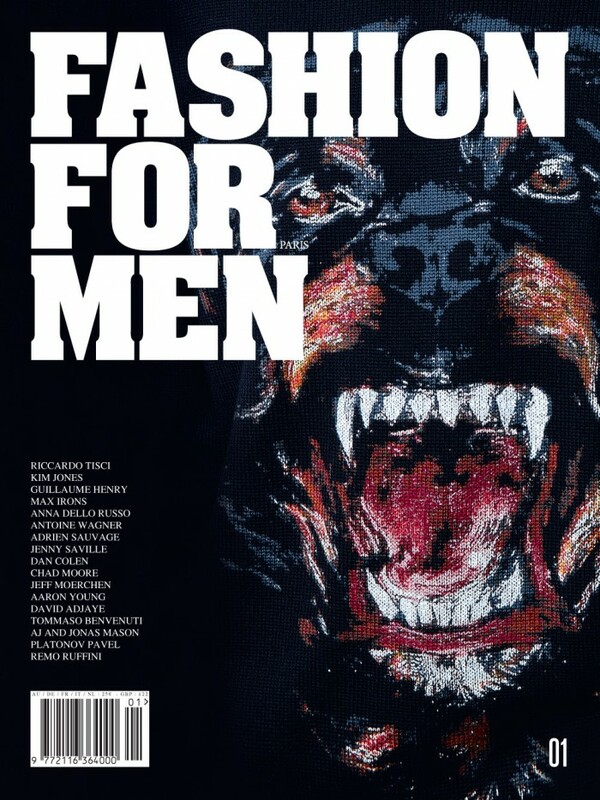 Fashion For Men issue n°1 is about 620 pages of the best of the best fashion for this winter season and next spring. Half of the magazine is already a preview of next season. MDC: How frequently will Fashion For Men be published? MDC: Finally what would you say sets it apart from other men’s titles on the market? MV: No magazines gives so much space to men’s fashion and accessories. It’s a real “Best Of”. The paper is ultra luxurious. The magazine has a hard cover and is closer to a book than an actual magazine. It’s a fashion diary of the last six months. I also wanted people to discover interesting men, not necessarily famous people, through long interviews and beautiful portraits. Been waiting for this one for a while. I can’t wait to see inside. Fashion Bible FINALLY! this magazine will change everything!we missed you Milan and your stunning team!!! Well Done Milan, good luck, can’t wait to buy the first issue! Where can we find an overview of where to buy the magazine. I live in Amsterdam and NEED to have this! CONGRATS Milan!!! Where in NYC can I Purchase A Copy??? Or Should I wait for A Signing Appearance!!! :) Bravo!!! It will be a landmark in men´s fashion history! Hey for everyone looking to buy this, it can be purchased here its sold out! This WILL be good! Cannot wait to pick up my copy. does anyone know if It is being sold in stores in NYC? So refreshing to see a Men’s fashion magazine. Hopefully it skips out on the homoerotisism. Just saying. I wanna check this out, where can I buy it?